Tenterfield Accommodations White and Red Rose Cottages are superbly appointed to create a truly romantic atmosphere for couples to simply relax. Established for special occasions, romantic breaks, weddings, honeymoons, short or long stays this accommodation option will leave a lasting impression. These stylish cottages have not lost any of their character only enhanced by the provision of luxury fixtures, fittings and amenities. One of the most photogenic places we have ever stayed, a pure delight. Everything in the cottage is of high standard. Timeless and simplistic in design the local heritage listed stone walled building was built to stand the test of time and will remain this way for many decades to come. Red Rose Cottage is set romantically within a beautiful cold climate garden and surrounded by traditional iron bark post and rail fences. On the doorstep of the cottage is a beautiful alfresco dining area under seasonal grape vines entangled around a gorgeous heavy iron bark pergola. A large dining table and iron chairs sit adjacent to the original 1800s cottage water well, garden and trees with views of the Post Office clock tower that chimes on the hour. A cosy and private setting Red Rose Cottage is perfect for those romantic weekends or extended stays where it should just be the two of you. Wake up in a queen bed surrounded by European pillows and birds chirping out side. Enjoy breakfast in the alfresco dining area or the privacy of your own cottage. Star gaze the big southern skies or relax with a local wine by the cast iron fire place. Enjoy dinner using the well equipped kitchen which includes a range of complimentary items including sugar, olive oil, herbs, tea, instant and ground coffee. Your heritage accommodation is conveniently located within 600m stroll to Tenterfields Post Office, main historic shopping and business precinct. Why not visit one of Australias most charming movie theatres in the Sir Henry Parks School of Arts building for a truly memorable evening, you will think youre in Gold Class. A short drive can take you too many local restaurants, cafes, wineries, galleries, beautiful gardens, museums and golf course. For bush walkers, a great base for experiencing the tracks, creeks and rivers, wildlife, wildflowers of our nearby national parks along with the Granit Belt and all it has to offer. Wildflowers and stunning granite landscapes are special features of Girraween, Boonoo-Boonoo and Bald Rock National Park. Boonoo-Boonoo has a spectacular waterfall and boulder river where Bald Rock has the largest granite rock in Australia and offers simply breath-taking vistas when approaching, during the climb and from the peak. The cottage is available for location hire and photo shoots and has a strict No Smoking policy. Accommodation is suited to Adults Only, Sorry No children or infants are allowed. Pets, as much as we love pets, unfortunately with the type of furniture in the house along with the unfenced garden makes it totally unsuitable for pets. For the peaceful enjoyment of all concerned parties and functions are prohibited and the price charged is for domestic use and not commercial use. If the dates you would like are not available or you have a larger group please consider Elgetha, a recommended neighbouring property also featured on Stayz. 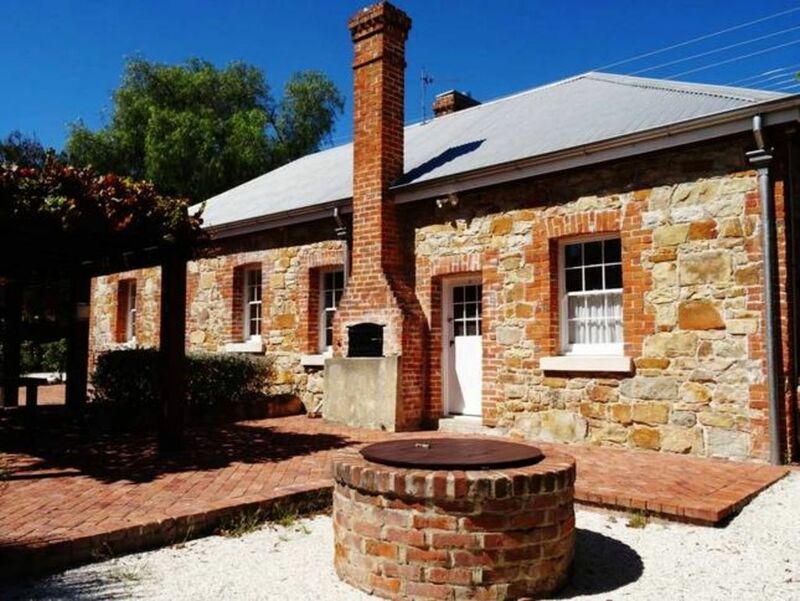 Red Rose Cottage is one of Tenterfield's original stunning Stone Cottages, Private and fully self contained romantic getaway. Wake up surrounded by European pillows under the bedroom chandelier. Tenterfield has some lovely boutique shopping which may surprise you. Local restaurants, pubs and wonderful quirky cafes or enjoy a meal at the cottage. There are several local wineries well worth a visit that are easily accessible from Tenterfield along with the diversity and splendour of Southern Queenslands Granite Belt wine region a short 30 minute drive across the border. Why not leave your car and explore the town on foot starting along Tenterfield Creek and circumnavigating the town taking in the colours of autumn and some of the many points of interest along the way. For those with a passion for exploring beautiful rocky our crops, rivers, waterfalls and spectacular views the sky is the limit in this region. We have many national parks and hiking trails to choose from and range from easy strolls to more serious treks. Tenterfield Tourism can provide information and National Park information and maps. Bald Rock National Park experience is one of the most impressive and beautiful walks in the entire region. Local swimming holes in national parks such as Boonoo-Boonoo along with the well run local Council swimming pool are well suited to summer months. Local gardens, galleries, monthly markets, farm gates, soaperie, bush drives and regional highlights ranging from fossicking to food, wine and natural wilderness, we have some unique experiences waiting for you. Tenterfield Golf Club boasts a beautiful 18 hole course, you wont be disappointed. WE COULDN'T HAVE PICKED A BETTER PLACE FOR OUR 25TH WEDDING ANNIVERSARY AWAY WEEKEND. WE WILL DEFINITELY WANT TO BE BACK.! Let me just start by saying what a fantastic place, not only has it been very tastefully renovated we loved all the attention to detail down to the coffee machine in the well appointed kitchen and the heated blankets In the bedroom which where a god send as outside it got down to -2. The photos don't do it justice as the place looks better in the flesh. Bruce was very helpful with our booking and very attentive to our needs. We would recommend this place to anyone wanting to get away as there is plenty to see and experience in the little town of Tenterfield. Thank you for the experience, definately a place to return to in the future. P.s. Awesome to find out we were the first to stay after the cottage's facelift.